The Central Hub at Aljada will be designed by Zaha Hadid Architects. Zaha Hadid Architects (ZHA) has been chosen to design the centrepiece of Sharjah’s $6.53-billion Aljada project. 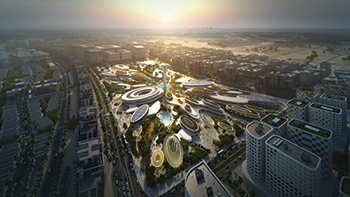 Sharjah-based developer Arada has appointed Zaha Hadid Architects (ZHA) to design the Central Hub, the centrepiece of its $6.53-billion Aljada project in the UAE emirate. The heart of the Dh24-billion ($6.53 billion) Aljada mixed-use development, the 1.9-million-sq-ft Central Hub will be a new focus for the UAE and a significant addition to Sharjah, regarded as the cultural capital of the Arab world. Aljada’s Central Hub will be a major destination for tourists and residents in its own right, offering world-class amenities complemented by community facilities as well as retail and dining experiences. The Sama Majlis Villa in Sharjah ... the terrace has an open-air majlis. The first phase of the Central Hub will create a lively, family-friendly destination with a series of attractions and activities for residents of Sharjah to enjoy the Aljada site throughout the year. These include an adventure activity zone, a food market showcasing home-grown delicacies and outdoor events spaces. Aljada was launched by HH Sheikh Dr Sultan bin Muhammad Al Qasimi, Supreme Council Member and Ruler of Sharjah in early September 2017. The 24-million-sq-ft project has become Sharjah’s fastest-selling residential community. To be delivered in phases beginning in 2019, the entire project is expected to be completed by 2025. CH2M has been awarded the infrastructure design contract for the project. Meanwhile, Arada has launched a new type of property, the Sama Majlis Villa, at its Nasma Residences community in the heart of New Sharjah. The developer confirms that construction work on the project’s first phase is 20 per cent complete and is on schedule for the first homes to be delivered to buyers by the end of this year. The Sama Majlis Villa is a four-bedroom independent property with an open-air majlis based on an upstairs terrace. The villa was launched at a sales event last month (March), where it met with significant interest from investors from around the UAE and beyond. Other units on sale at Nasma Residences include two-, three- and four-bedroom townhouses and semi-detached villas, and four- and five-bedroom signature villas. The Sama Majlis Villa is being sold in Phase Three of Nasma Residences, an 800-villa and townhouse community ideally located adjacent to Emirates Road and Maliha Road. The main construction contract for work on Phase One of Nasma Residences was awarded to Intermass Engineering & Contracting, while contracts for Phase Two were won by two separate companies: Intermass and Klampfer Middle East. Work on Phase Two has already commenced, with excavation and foundation works under way. Arada expects to award the contract for Phase Three in May, with the entire community scheduled to be completed by the end of 2019. Spread over an area of 5 million sq ft, Nasma Residences has been carefully planned to ensure a balance between living areas and community facilities. Keeping homeowners’ comfort and convenience top of mind, Nasma Residences will be anchored by four community offerings: a 13-acre lushly landscaped park with cycling and jogging tracks and large play areas; a multi-purpose community centre with club house offering sports and recreation facilities; children’s nursery and full-service medical clinic; a Gems international school; and Nasma Square, a 70,000-sq-ft retail mall. Homes range in size from 1,500 sq ft to 4,400 sq ft, and start from Dh1.04 million ($284,511).